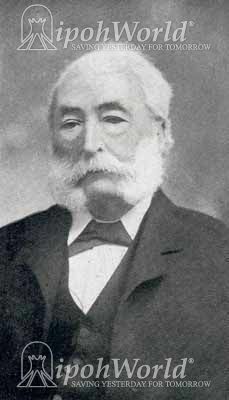 Hugh Low was born in Clapton, England on 10th May 1824. The son of a Scottish horticulturist he gained a lot of botanical experience in his father’s nursery. Consequently it was no surprise when his father sent him on a collecting expedition to Singapore (in 1844), from where he became particularly interested in the flora of Borneo. This in turn led him to Sarawak and Sir James Brooke, the White Rajah of Sarawak, who subsequently appointed Low as Colonial Secretary of Labuan. He married Catherine Napier (in 1848), daughter of Colonel William Napier, the new Lieutenant Governor of Labuan. It was here in Labuan that he gained administration experience, fluency in Malay and a solid reputation as a naturalist. In 1851, at the age of 27, he was the first person to climb Mount Kinabalu and the first peak he conquered is named after him. He remained in Labuan for 30 years. Meanwhile, with Hugh Low firmly settled and comfortable in Labuan, Perak State was in confusion. After the Pangkor Treaty (signed in January 1874), the first task was to stop the warfare between the opposing gangs in Larut where Captain Speedy as Assistant Resident (and his Sepoys), had been sent as part of the Treaty to do just that. There was also the need to curb piracy and appoint the First Resident. Here, early in November 1874, entered J W W Birch and as the record shows he was not the best choice, lasting only one year before being assassinated by the Malays. There followed the Perak War that left nearly all high-ranking Malay officials either dead or in exile and when the war ended in early 1876, Birch’s successor, James Guthrie Davidson was appointed Resident. This was another unfortunate appointment for Davidson was said to be ‘uninspiring’ and stayed out of Perak in the comforts of Singapore whenever possible. In April 1877, the Colonial Office transferred Hugh Low to become the third Resident of Perak (1877-1889), ‘adviser’ to the Sultan whose advice was binding in all matters except for custom or religion. History shows that he landed at Telok Kertang on April 19, 1877 and walked to Matang, determined to respect the customs of the people and undo the wrongs that his predecessors had forced upon the local people. At last the British Colonial Office had appointed an outstanding administrator, despite his age (he was 53 on appointment) and his preference for the quiet backwater of Labuan. Coincidentally, his nephew Hugh Clifford (later Sir Hugh Clifford) had just left Perak having been a cadet there for the last four years. Formation of a State Council in which Malays and Chinese took active part in planning the policy for State development. The first meeting was in December 1877 and it won over the Malay Chiefs who, not surprisingly, had previously been very unhappy with the Resident system of “Do as you are told!”. The Council remained a valuable asset until the formation of the Federated Malay States in 1896. Making use of prominent local leaders at most levels of his administration formal and informal. This included a close business and personal friendship with Kapitan China Chung Keng Quee who, encouraged by Low, used modern British mining equipment to lead the way for the other miners to adopt these production-improving tools. He also worked closely with Raja Yusof (the Raja Muda) and Raja Idris (later Sultan Idris Murshidul'adzam Shah) to bring about order in the State, pay off the debt of 800,000 Straits Dollars he inherited, and re-establish confidence in the British Residential system. Returning the management of the villages to the Malay Penghulus (Administrative Chiefs) that Birch had taken from them, thus creating stability within the villages and the State. Using the goodwill and trust created by the above measures he managed to abolish debt-slavery by 1883, a practice that the Malays had enjoyed for as long as could be remembered. Putting in place ‘land laws’ (in 1879) that created confidence among the tin miners which in turn increased mining productivity and exports, bringing valuable income to the State. The building of roads to allow effective administration of the State and improved movement of tin and other goods. Creating the first railway from Taiping to Port Weld for the transportation of tin, replacing the elephant transport used previously, thus speeding up the tin exports. Connecting Perak to Penang and Province Wellesly by a telegraph line through the jungle. This was completed in 1884. Another notable achievement for Low was the Perak State Museum, started at his suggestion in 1883 and the first in Malaya. Originally housed in two rooms of the Taiping Government Building amd with Leonard Wray appointed as curator, soon the museum ran out of space and a new building, still in use today (2009), was built in 1885. In 1883, six years before his retirement Hugh Low received a Knighthood, unusual to say the least for normally such accolades only appear after leaving the Colonial Service and shows the respect that his superiors had for him. He eventually retired in 1889 at the age of 65, having turned around the fortunes of Perak, provided stability among all the people and change with cooperation, not friction, for the Malays. Indeed just six years after Low left Perak, in 1895, it was the Sultan of Perak who pressed for more of the same policy when he advocated a Federation of States. But Low never forget his reason for first arriving in Singapore - horticulture. During his time in Perak he pioneered experimental planting of rubber, coffee, black pepper and tea. Indeed Rubber cultivation in Malaysia actually began with Sir Hugh Low in Perak and one of the seven trees he grew from seed in 1882 still survives today (2009). The photograph is believed to show him in his retirement. He passed away on 18th April, 1905, in Alassio, Italy. To read more about J W W Birch click here. To read more about The Pangkor Treaty / Pangkor Engagement, click here. To read more about Captain Speedy, click here. To read more about Sir Hugh Clifford, click here. To read more about Sultan Idris Murshidul'adzam Shah, click here. To read more about Leonard Wray of the Perak Museum, click here.